Fractal Domains features anti-aliasing. This page demonstrates the improvement in image quality that can be achieved (at the cost of much higher processing time) when anti-aliasing is applied. Aliasing occurs when a discrete grid (such as the pixel resolution of your display or printer) is superimposed on a continuous image which contains sharp edges or fine detail. The “jaggies” you see when a straight line or images with sharp discontinuities are displayed on a computer monitor are examples of artifacts caused by aliasing. 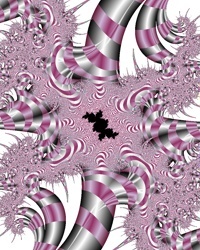 Here is an example of a fractal image created without anti-aliasing. The image basically consists of stalks or tendrils of four colors which become very thin at the ends and wrap around each other in intricate patterns. In the spots where they become thin and intertwine, this image becomes mottled, and it becomes very hard, and in places impossible, to distinguish the individual tendrils. The mottling, and other artifacts such as jaggies where there should be smooth boundaries, can be minimized by sampling the continuous image at a higher resolution than the final image desired, then applying an anti-aliasing filter that removes the high-frequency components that produce the artifacts before sampling down to the desired resolution. 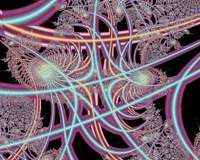 Most images in the Fractal Domains Gallery were generated with 4:1 anti-aliasing. Even for large images that I generate for printing I use at least 2:1 anti-aliasing. A 2:1 anti-aliased image takes four times as long to generate as a non-anti-aliased image. A 4:1 anti-aliased image takes sixteen times as long. Here is the same image generated with 4:1 anti-aliasing. Notice that the edges of the large yellow stalks, which looked ragged in the previous image, are now smooth. 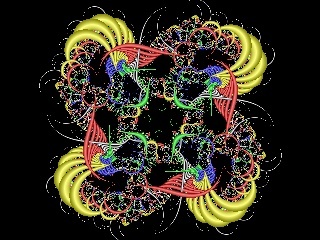 Many of the thinner tendrils that were mottled and had gaps in the previous image are now smoothly connected. 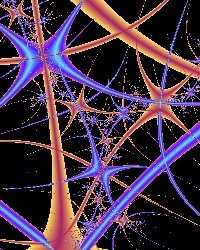 Below are some more examples of fractal images produced with and without anti-aliasing.